I just realized there are no videos here of Straight No Chaser. I’m not sure how that happened, since these are funny and really well-done. I know these aren’t new, but if you haven’t heard/seen them, you should check it out. Even if you have seen these already, they’re worth seeing again. FYI, the group is putting out new music, but here are their two classic Christmas songs. First is “The Christmas Can-Can (Animated Version)”. Someone made a video to go with the funny lyrics. If you haven’t seen them perform it live, it’s amusing, too, and you can watch it on YouTube here: Straight No Chaser – The Christmas Can-Can (With A Special Greeting). Lastly, here’s “The 12 Days of Christmas”, as only Straight No Chaser can sing it. Recently I went to a free concert by the Conway Men’s Chorus, and they performed a funny version of Deck the Halls (Fa La La La) where they incorporated various other songs in with it, in a way you wouldn’t expect. It’s in the video below, starting at 3:55. I watched Rudolph the Red-Nosed Reindeer the other day, which is an awesome show. It’s part of my Christmas tradition. I used to feel like a misfit, so I can relate. Now I’m awesome, just like the show works out for our misfit friends. One part of the show that always amuses me is Mrs. Claus telling Santa Claus, “Eat! Eat! Whoever heard of a skinny Santa?” Now that’s the kind of job I need! Of course Santa has other major responsibilities, like overseeing toy production and delivering toys, but that wouldn’t take up too much time. The rest of his time is devoted to being fat. What would you think if part of your job requirement was being overweight? Could you handle that? For most of us, if our belly shakes when we laugh, people look down on that. But with Santa, it’s cool. So with all that in mind, I’ve decided I want to be Santa Claus when I grow up. 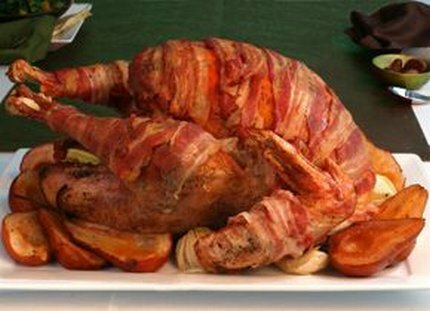 For this week’s caption contest, we’re going to feature a Christmas / holiday themed picture. 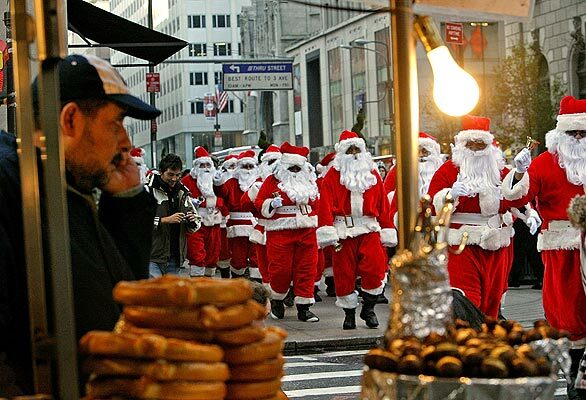 Here is a parade of Santa Clauses, walking down the street in New York City. (NEW YORK CITY?!?) So what is the purpose of it? Is there a special occasion, or is it a secret mission? Is it a conspiracy? What are the onlookers thinking? What should be done about this situation? 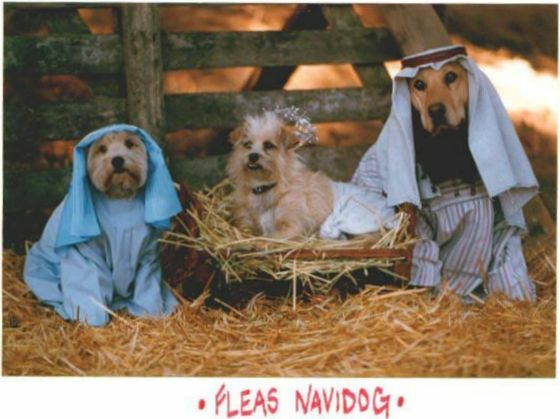 If you don’t get the joke / pun, it’s that “Feliz Navidad” means “Merry Christmas” in Spanish. I’m not sure if knowing that makes it any funnier (because it is a pun, after all), but it may cause some of you to groan (which I suppose is the purpose of puns).